At first I titled this post How to Ruin Relationship Electronically. I did so to drive the message home. Later, I rewrote to paint a more positive message. Well, the quickest way to ruin relationship is to send email, text messages, and Facebook PM when you are upset. Even in the comment section on Facebook, if you are not careful, you will offend and hurt others. How many times I typed my comments and didn't send? I have lived long enough to say that many of our means of communication do not work in resolving conflict or issues. Relationship are ruined because we do not communicate well. Unfortunately, lots of conflicts are direct result of miscommunication via emails and other form of electronic communications. Some major forms of communication that do not solve issues well when you are angry, upset, or emotionally down. I had my fair share in all this type of communications in the past. TEXT MESSAGE (Short Messages Service - SMS). Let's start with text messaging or short message service (SMS). This has become an inexpensive way of communication through the use of mobile phones. While it is a good way of communication, often, text messages do not work well when one is upset. When upset, you are free to key in your text message but do not send. Let it sit there for a night. Read the following day if you still want to send that text. Another effective yet destructive means of communication is E-mail. Email is very effective tool of communication but a destructive form when you are upset, angry or emotionally down. If you receive a firestorm email accusing you of something you have not committed, or when someone misunderstood your intention and send you critical email, the tendency is to justify yourself. In doing so, you send a firestorm email to that person, unknowingly or intentionally. This way, there is no end to the critical spirit. I have so many experiences in the past where I sent firestorm emails to people. Had I known better, I would have been more careful. My advice is, you go ahead and write that email express everything you would like, but don't hit that send button. After a day or two, read again. If your tone is exactly the same, it means your emotion has not died down. Don't send! If after few days and you really want to send that email, ask a trusted friend to read the email and ask for a feedback. A trusted friend can offer balance perspective that you might not see. If you must send the email, meet up with your friend in person and discuss the email re-write it before sending. Better yet, never send that email if you can reach the person on Skype call. Talking on Skype will solve and settle issues that email would not. By all mean, seek to call the person not email. Skype is free why not use it. Send email and schedule a skype call instead of buckling your defense and firing your bullets! This is also pretty popular and may people use it to communicate quickly. For inquiry and casual communication this is okay, but my advice is not to use when trying to solve an issue. When I was new on Facebook, in 2009, I offended someone by commenting on his post because he misinterpreted what I said. Although, we settled the issue through the PM section it was a bit tough and he called me "What's wrong with you man?" 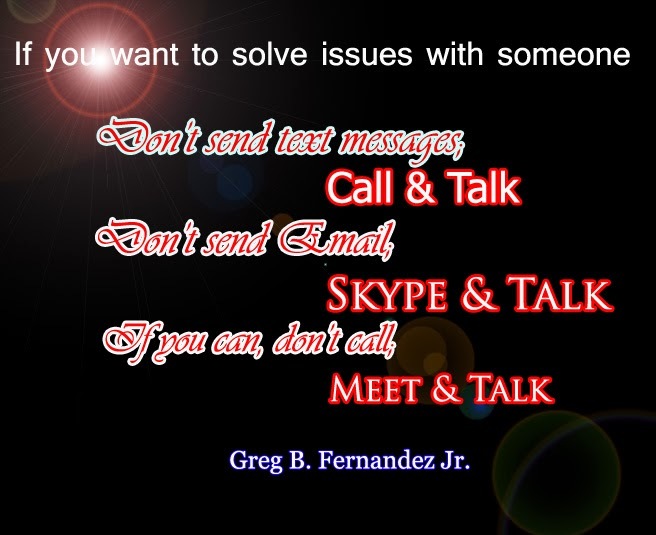 If you want to solve issues with someone, don't send a text message; call! Don't send email; skype! If you can, don't call, meet in person!